I am always envious of dog owners who post pictures of their dogs with all their adorable stuffies and plush dog toys. The reality in our Golden house is that just one of those adorable stuffies will last .2 seconds before one of them has breached the fluff and stuffing is flying. 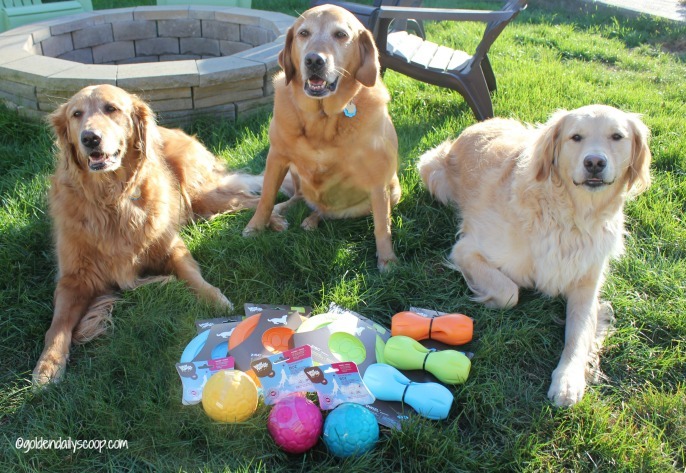 If you have a powerful chewer like the Goldens than you know exactly what I'm talking about but don't fret because we are about to introduce you to three toys that are durable and will satisfy your tough dog! Disclaimer: This post is sponsored by West Paw Design. West Paw Design is not responsible for the content of this post. 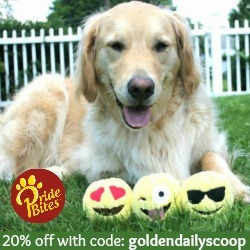 Golden Daily Scoop only shares information that we feel is relevant to our readers. 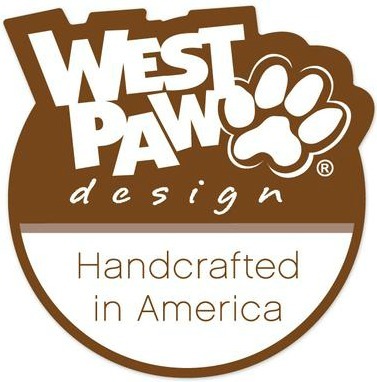 West Paw Design is a small manufacturer of high-quality pet products made in Bozeman, Montana and was named One of the Best Small Companies in America in 2016 by Forbes magazine. 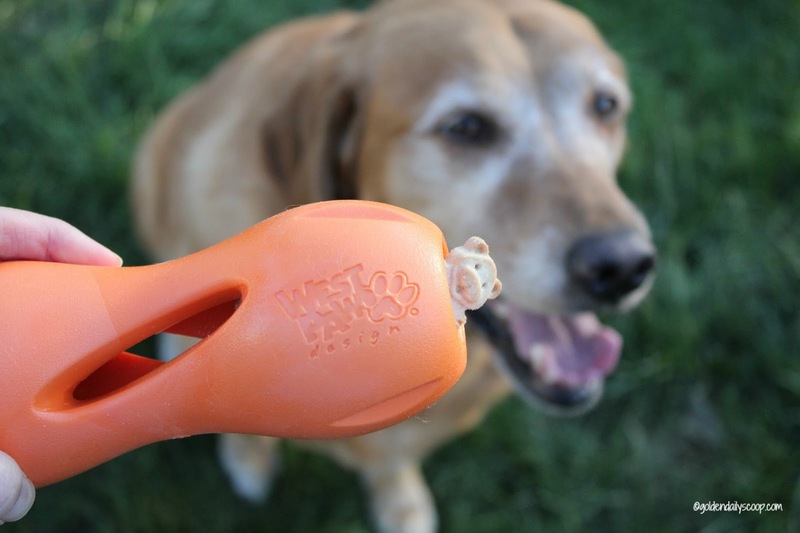 One of the first things that impressed me about West Paw Design is how durable and tough their toys are. 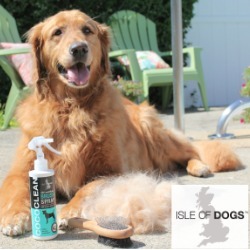 After browsing their website, it's clear to see there is something for every kind of dog and best of all their products are all made in the USA, eco-friendly, BPA- & Phthalate-Free, 100% recyclable, dishwasher safe and guaranteed. "West Paw Design Zogoflex® toys can be recycled into more Zogoflex—over and over again. Leftover shapes from toy molds, old Zogoflex toys that have Joined the Loop, toys that didn’t meet our standards—they all get sanitized, ground up, and fed back into our machine to make completely new bouncy, bright Zogoflex toys. Nothing diminishes Zogoflex’s potency—it can literally be recycled indefinitely." The NEW Zogoflex Qwizl Treat Toy is an interactive treat-dispensing toy that will keep your dog stimulated and satisfied. I stuffed the Qwizl with a few of Maggie's favorite cookies and watched her get to work. This is a great toy for her since she can't do a lot of running and jumping due to her hip dysplasia and arthritis. 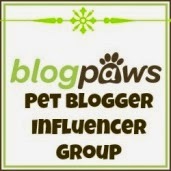 This is also a great option for senior dogs to help stimulate them with interactive play. So while Miley and Bruin are rough housing, Maggie is perfectly happy working her treats out of her new toy which kept her busy for quite a long time. The Qwizl comes in two sizes, small & large and three fun different colors - aqua, tangerine and granny apple. Miley loves a good game of frisbee. Even though she doesn't always catch them she has fun trying but they usually end up broken and in the trash. 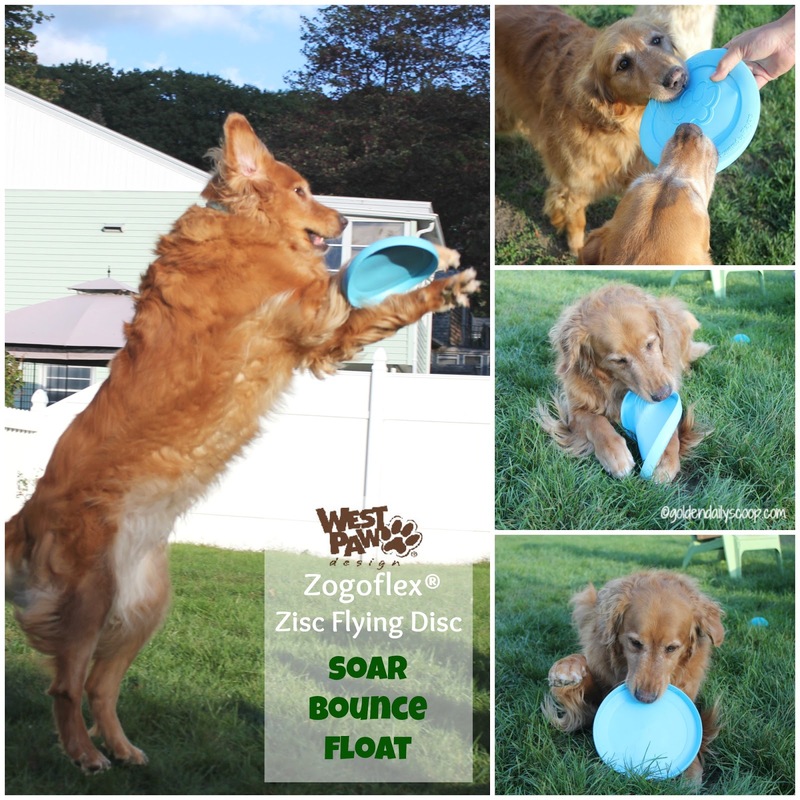 The Zogoflex Zisc Flying Disc has changed all this, it's durable but easy on her jaw and teeth. The Zisc is great for playing frisbee or a game of tug, it's durable enough to withstand Miley's Golden jaws. After all that fun, throw it in the dishwasher for a good wash! The Zisc comes in size small & large (Miley has the large) and four colors, aqua blue, tangerine, granny smith and glow-in-the-dark. Now that's a game we have yet to play - glow in the dark frisbee! 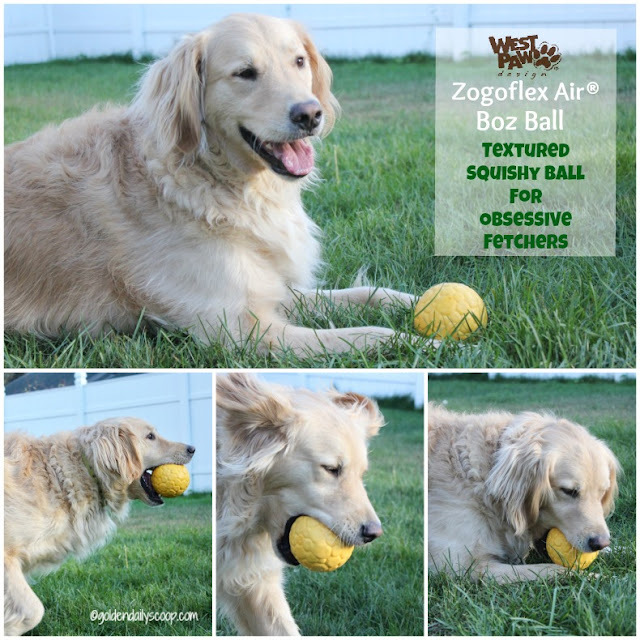 The Boz Dog Ball is made with Zogoflex Air®, a durable squish with an air-injected center which makes it float higher and tossed further while still being durable on the outside. Bruin is a ball-obsessed dog in every sense of the word and he has definitely met his match with the Boz. 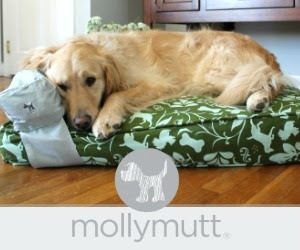 It's so much better and more durable than a tennis ball and is non-toxic. If you have an obsessive chewer and fetcher like Bruin give the Boz a try, it's light enough to play a game of fetch and durable enough for them to compress with their teeth. The Boz dog ball comes in size small & large (Bruin has the large), the small size will fit in a ball launcher both come in dandelion, peacock and currant. 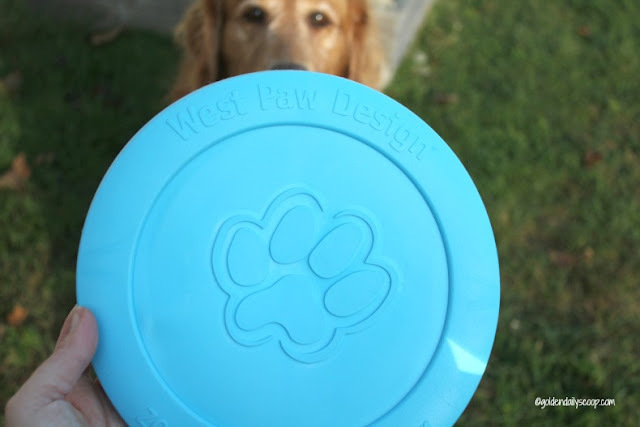 If you are tired of throwing away toys that your dog has ruined we recommend giving West Paw Design toys a try, they are Golden tested and approved! Do you have a tough dog? Which West Paw Design toy do you think your dog would like? i love these toys, however, my dental vet says no for my girls. only soft plushy toys, i have little girls, and they have some teeth problems so no hard toys even though i think they are very nice. Most of our toys last forever. Bailie is the only one who sometimes destroys stuffies, but we have a whole room full of toys just waiting to be played with. These look like fun for you guys. Those look like great toys! The boys love their stuffies but sometimes Pierre gets in a "killin'" mood and takes off an arm or tail. Luckily, I keep a needle and thread at my desk for those times. Neither are big Frisbee players but I love to play. LOL! That's a great tip, I have tried to sew some back together but I am not an expert when it comes to needle and thread! The Zogoflex Qwizl Treat Toy will be the ideal toy for my senior dog, Soldier. He needs mental stimulation but has trouble getting around, so the Qwizl should be perfect for him (he's also very motivated by treats). Thanks for including a durable toy for senior dogs! 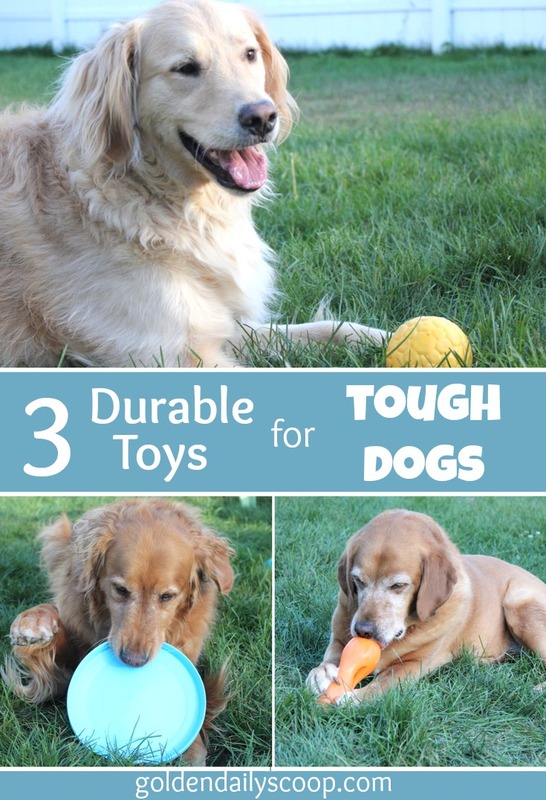 Thanks for sharing this great solution for dogs who are tough on toys. I hadn't heard of West Paw Designs and am going to start following them on social media. 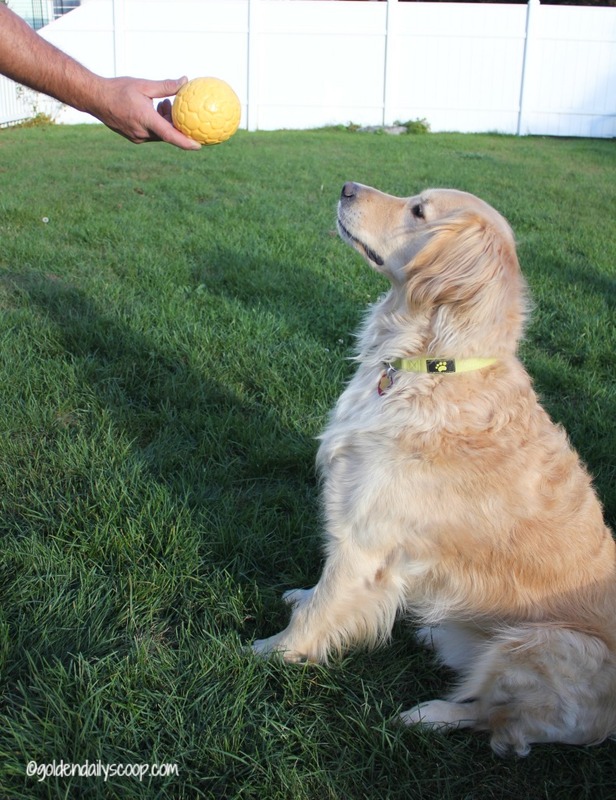 Happy-Go-Doodle Chloe is 100% ball dog, so the Boz dog ball would bring a smile to her floofy face! Mr. N would like the treat toy best. He's never destroyed a toy except for a cat one that I think was not meant to hold up to dog play. We have toys from back when we adopted him! Paws up for tuff dogs! BOL! Wow they look durable and as if they will last forever. At last pups have toys that will last - what a relief for their parents!! Love these toys, we often baby sit a big german shepherd mix who loves to play and would love to get one of these for him. Wow these West Paw Design toys look great. 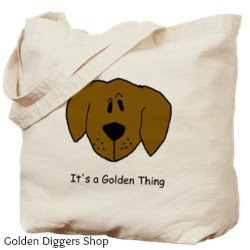 Like you mentioned, the fact that your goldens didn't destroy them mean they passed the doggie test. Nice! I'm sure many other dog owners can appreciate that. Will share. These toys look great. My mom's dog loves to chew, but we need to be more careful since he is having some teeth problems now. It's always best to be careful when it comes to their teeth, West Paw also has some great plush toys! Sophie and Theo love Zogoflex toys. Theo normally destroys all plush toys, but he is really gentle with West Paw plush toys. The first plush toy to survive Theosaurus Rex was a West Paw carrot. It has been over a year and it is still in good condition. Many other brands of plush toys have not survived, even after he showed he can be gentle the ones he loves. That's great to know! I will have to give their plush toys a try! I think you wrote this just for me! With Siberian Huskies, stuffed toys become unstuffed toys in a matter of seconds! I love the Qwizl. Toys with treats, perfect! I think this just made it on the list for my Sibes for Christmas! Thanks for the great review! That's great news, I am so happy to hear this. It's never to early to start a Christmas list! 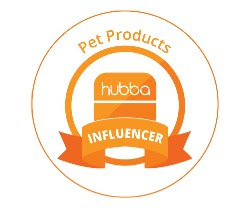 My dogs are power chewers so I'm always on the look out for durable new dog products. These look amazing! I'm really interested in both the treat dispensing toy and ball. Same here! We are so happy to find something that lasts! The only thing that was ever able to last with our dogs is the black Kong. Though the Flying Squirrel kind of lasts too, because it still works even when parts of it are shredded.